Prostitutes behind a window in the Yukaku (red light district) of Yoshiwara in Tokyo. Prostitutes from less expensive brothels were seated behind wooden latticed windows called harimise (張り見世). As a result of intense international pressure, putting prostitutes on display in harimise was prohibited in 1916. 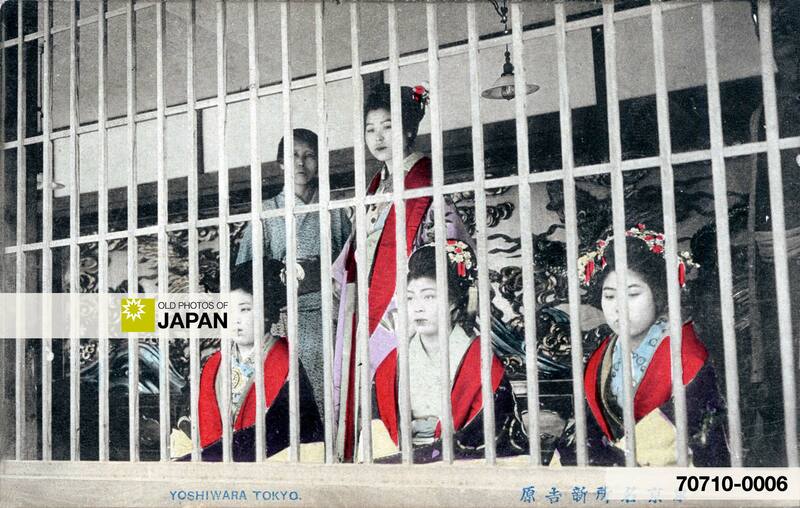 For more information on Yoshiwara, see Tokyo 1910s • Yoshiwara Prostitutes. As it is unclear at which brothel this photo was shot, the Google Map below shows the location of the former entrance gate, the Omon (大門), located in current-day Senzoku 4-chome, Taito-ku (台東区千束4丁目). You can also licence this image online: 70710-0006 @ MeijiShowa.com.